It’s the height of summer in Toronto and sometimes the only thing that we want to do is drink something icy cold. The only problem is that ordering lemonade at a restaurant or cafe is a guarantee for consuming added sugar. And, although drinking unsweetened lemon water is still refreshing, it just doesn’t have the same appeal as a classic glass of iced lemonade. The secret to finding that perfect glass of sweet lemonade (without the sugar) is to make it with a specific combination of ingredients that will provide the sweetness without the added sugar. There has been a lot of hype about the plant stevia and using it as a sweetener instead of the artificial chemical sweeteners. Stevia is a plant that naturally has sweet tasting leaves (while containing no sugar), so when it’s ground up into a fine powder it can be used in cooking, without having any effect on blood sugar. The only downside is that stevia has a strong after taste and is quite noticeable in recipes. But, when paired with lemon, the after taste disappears! This recipe could be made with just lemon juice, water, and stevia if you want to avoid all sugars (even from fruits). 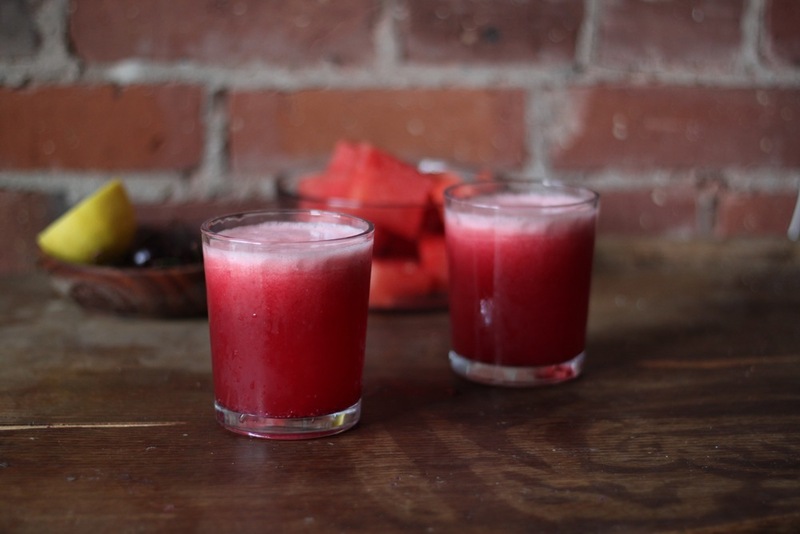 But, we made our lemonade with a handful of cherries and a few slices of watermelon, which made a beautiful and delicious combination of flavours. 1. Slice the peel off the lemon, but leave the pith on (the white part). The pith is actually rich in vitamin C.
2. Add all ingredients to a high power blender and blend until liquified. 3. Serve in glasses and enjoy!